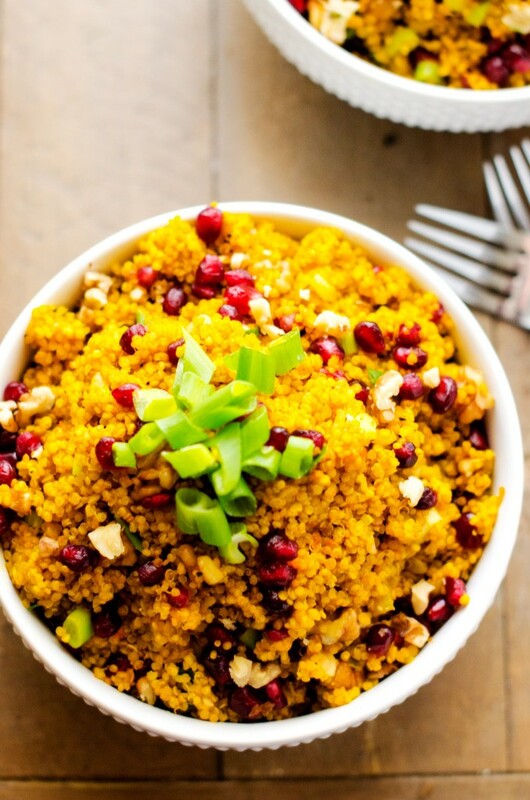 This Turmeric Quinoa with Pomegranates and Walnuts is packed with superfoods! 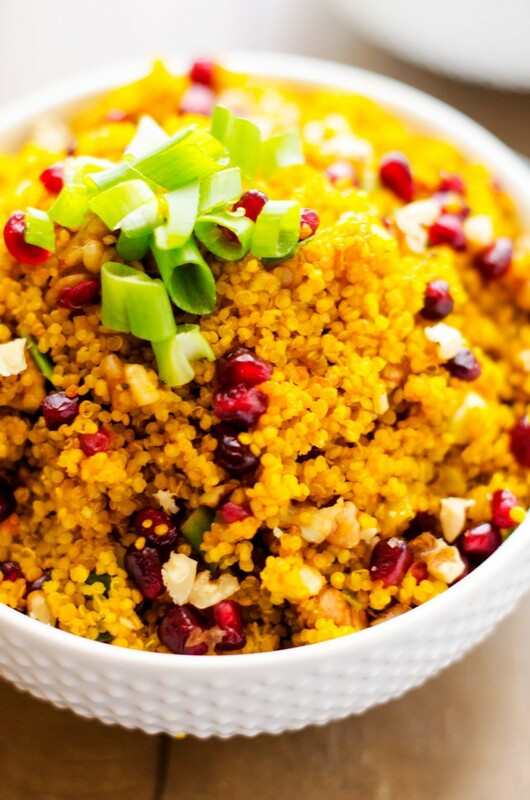 With quinoa, turmeric, pomegranates and walnuts, this vegan quinoa recipe shines. This is a sponsored conversation brought to you by 3 Squares Kitchen Appliances. All opinions are 100% my own. Around the holidays, I’m always looking for recipes that are easy to make, don’t require valuable oven and stove space AND taste delicious. Score extra points if they are also allergy friendly and appealing to both vegans and carnivores alike. It sounds like a tall order, but today I’ve got a healthy side that the whole family will love. 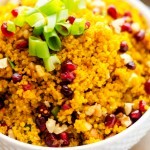 This Turmeric Quinoa with Pomegranate and Walnuts easy to make, beautiful on your table and so delicious. Did I mention easy? Yes, but I’ll say it again. We are talking less than 10 minutes of hands-on time. I make it in my TIM3 MACHIN3, which is how I cook all of my quinoa and rice these days. It is quite simply the best way to cook quinoa. I know that sounds like a tall claim, but I mean every word of it. The days of quinoa being stuck to the bottom of the pan because I got hung up with the kids and it stayed on the stove for too long are gone. I know a lot of you like to cook your quinoa in a rice cooker. While this can be an ok method, you miss one of the most important steps, which is toasting the quinoa to bring out the flavor. 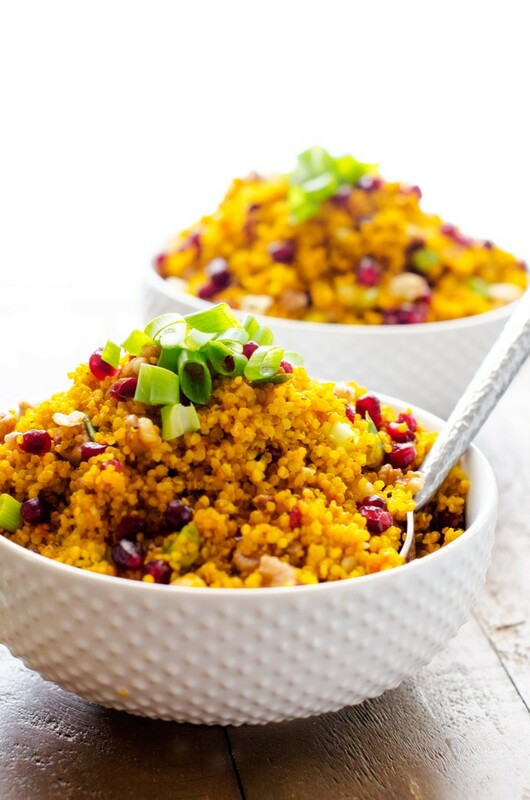 This Turmeric Quinoa with Pomegranates and Walnuts is packed with superfoods! 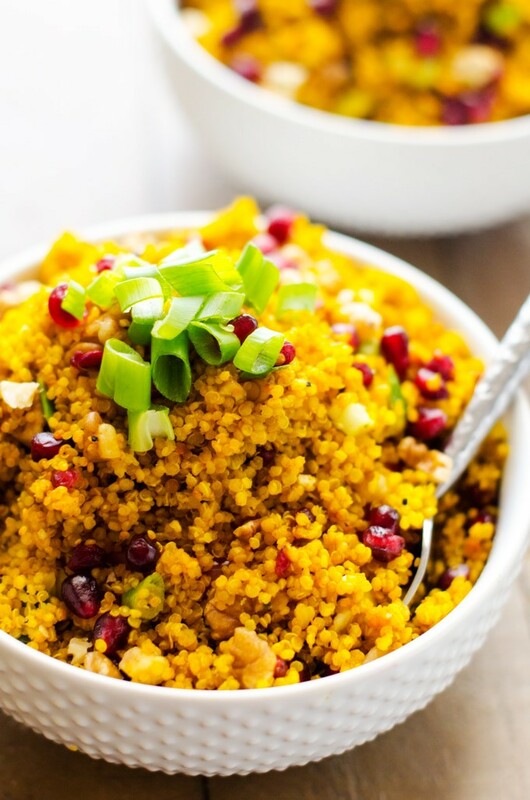 With quinoa, turmeric, pomegranates and walnuts, this vegan quinoa recipe shines. This amazing vegan quinoa recipes is the perfect side dish for your holiday table, but simple enough for every day. Turn on the TIM3 MACHIN3, to quinoa setting and hit start. Add olive oil, onion, garlic and quinoa. Toast, stirring often, until machine beeps. Add turmeric and vegetable broth and hit start again. Cook until done. (The machine will beep to let you know.) You can also cook the quinoa on the stovetop if desired. What a beautiful color this dish has! I love everything in it. Will have to check out that appliance, it looks really cool!! It is really amazing! I use it daily. That sounds like an amazing machine – I’ll have to check it out. The recipe looks amazing, too. Such wonderful flavors and so vibrant! I love how colorful this dish is! It would be perfect on a holiday table. Thanks so much! We really enjoyed it. I made this last night, and I cannot begin to tell you how happy my tastebuds were! Even my two boys (2 and 4 years) liked it. I was a little worried that much turmeric would make it bitter, but it actually wasn’t bitter at all. My 4-year old wouldn’t eat the pomegranates because of the hard seeds, but my 2-year old wouldn’t eat any bites that didn’t have at least one pomegranate seed in it, so it worked out 😉 . I don’t have the magic machine you mentioned, so I “toasted” the quinoa in a saucepan and then cooked it on the stovetop- simmered on low 30 minutes. Also, I don’t buy walnuts, so I used toasted pecans instead. Thank you so much for the recipe! When pomegranates aren’t in season, I will probably continue to make it without the pomegranates because it was amazing without them as well! I am so glad that you enjoyed this just as much as I do! And even happier that your kids did. It is always such a win when you can get little ones to eat healthy. I didn’t find a link for the appliance. Could you tell me how to find it please?